New from Ranco: The Mash-O-Matic, the most famous automatic novel mashup maker on the planet! Writers, we know you've seen these hot, trendy books on the shelves making their authors uber famous and bringing in tons of royalties; now it's your turn to enjoy the ease, convenience and endless profits of creating your own bestselling mashup novels with little to no effort at all! 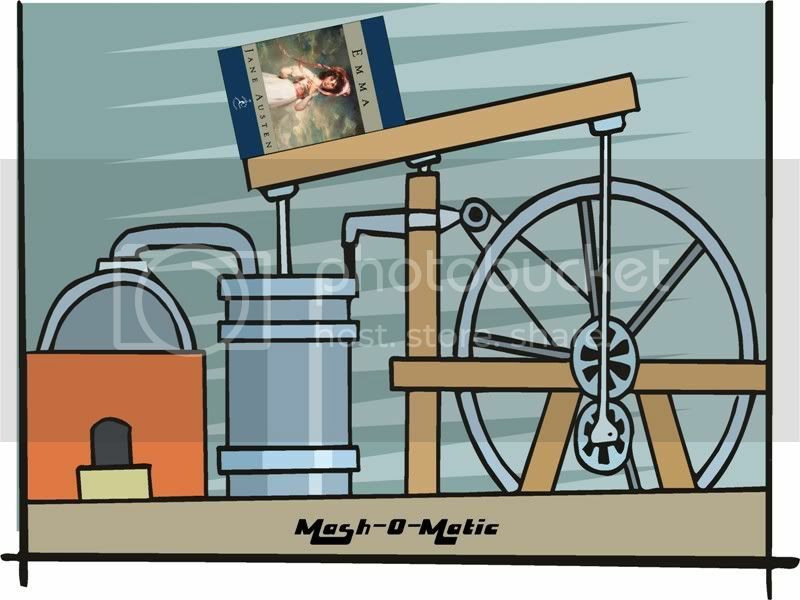 The Mash-O-Matic comes with an instructional booklet that shows you exactly how to take any famous book in the public domain, add just a few new ingredients and combine them to create new, fun, highly marketable novels! The Mash-O-Matic is so efficient you'll only have to spend a few minutes a day compiling your next bestseller. Plus there’s absolutely no hassle involved: the foundation book for your mashup has already been completely written by someone else who's dead and can't sue you over it. All you have to do is add a few common story elements that are probably right now sitting unused on your hard drive in all those half-written books you'll never finish anyway! The Mash-O-Matic also comes with powerful electrical story sorters and convection plot flow, uses 110 volts, 125 watts electricity, proudly made in the USA! Here's a personal message to you from our President, Ranc Maykker: "Writers, isn't it time you stopped slaving over the keyboard, and had more fun as an author? Are those endless hours you spend trying to write original novels really worth it, when you don't even know if you can sell the finished product? Don't waste another minute writing the books you hope your readers will love, give them what you know they already love with the Mash-O-Matic." But wait! As a part of our special introductory offer, if you order the Mash-O-Matic in the next thirty minutes, Ranco will also give you at no extra charge Ranco's famous EZReTitler Tool so you can rename your mashups, five manuscript mailers and a "I Mash, Don't You?" goldtone key ring. That's right, you get the fabulous Mash-O-Matic, the EZReTitler and all the extra goodies for just nine easy payments of $19.95! You'll earn that back in your first week on the Times Bestseller List, so don't delay, call right now! So.... is this really it? This is what I have to do to hit the lists? Hah! Oh, get-rich-quick schemes strike again! The sad thing is, you could put up a page selling that... and there are people that would buy it. I'm going to save my money until Mash-O-Matic comes out with a Thinly Disguised Copyright Violation add-on. If I can't replace the aliens in Starship Troopers with zombies, then it's not worth my precious, precious credit card details. Lolol. This is so razor sharp. omg! This Mashing tool is so my dream machine...money with little effort! The sadness is this is a real phenomena. I actually was offered to review one of these 'books'. I politely declined.It did not interest me. And yes Eva...I agree this is Razor Sharp! Love it. I cannot, will not read any of the mash-up stories that are out now. P&P and Zombies??? What kind of story is that? But what happens after I reach the 5 novel limit? Will I have to actually write my own books after that? I have just got to stop drinking while reading PBW! Replacing keyboards is expensive. I just want the key chain. That alone would be awesome. The sad thing is, I might actually pick up a book called Les Mummies Miserables. Maybe not buy it. But at least pick it up and carry it wround the store for a while. Nice. This is an unfortunate reality in story-telling-world. Not just novels: movies, video games, virtually all forms of story-telling media are guilty of mash-up. Makes some really bad stories and some very frustrated readers (at least those over the age of 18).